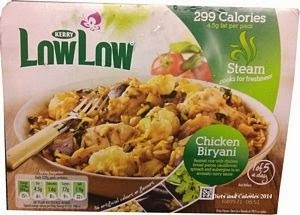 While shopping in the Morrison’s frozen ready meals area, I noticed a range called Low Low. For a calorie aware person like me, a name like that is hard to miss. It had to mean it was low in something. Calories, salt, fat? These warranted a closer inspection. Looking at the varieties available and checking the ingredients and nutrition labels, it’s clear to see these meals are meeting healthy guidelines for fat, salt and sugar. All meals have under 350 calories and not a red traffic light in sight. In fact, looking at the traffic light guide, the majority of them could be called Low low low low! The varieties available looked delicious, so I picked up one of each to try out. 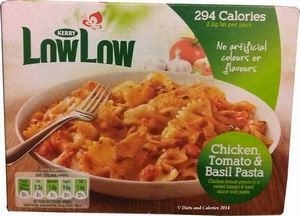 Low Low is a brand made by Irish food giant, Kerry Foods. You may already be aware of their presence in the dairy sector with their cheese. 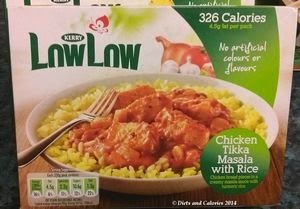 But now they’ve expanded into the frozen ready meals area as a direct competitor to Weight Watchers - Market leaders in the healthier ready meals sector. Ready meals have come under a lot of fire in recently, mainly due to their unhealthy levels of fat, salt or sugar. But manufacturers are either changing their recipes to make their meals healthier, or introducing new ones. I know food purists scorn the idea of ready meals and believe everything should be cooked from scratch. I do this as often as I can, but with a family of five, finding a single meal that everyone enjoys is sometimes nigh on impossible. 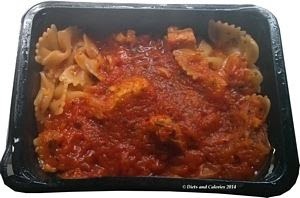 For those occasions when I want to cook something that I know one or more of my children won’t like/eat, it’s handy to have a healthy ready meal in the freezer. 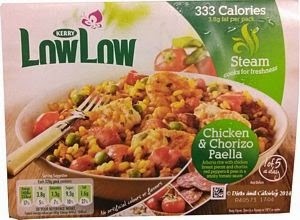 Kerry Low Low frozen ready meals consist of eight different meals. Four of these are regular frozen meals whereby you ‘stab’ the lid and pop into the microwave. The others, as I discovered when it came to cooking, are ‘Steamers’. These meals are packed in steam bags and contain one of the five-a-day. All meals have less than 350 calories and are 320g in weight. 326 calories, 4.5g fat, 2.2g saturates, 54.7g carbs, 10.6g sugars, 2.9g fibre, 15.4g protein, 1.g salt. 294 calories, 2.2g fat, 1.0g saturates, 50.2g carbs, 9.6g sugars, 2.6g fibre, 17g protein, 1.6g salt. 233 calories, 8g fat, 2.9g saturates, 25.9g carbs, 4.2g sugar, 4.5g fibre, 12.2g protein, 1.9g salt. 274 calories, 1.6g fat, 0.6g saturates, 11.5g sugars, 1.6g salt. 246 calories, 1.6g fat, 0.6g saturates, 14.7g sugars, 16.6g protein, 1.6g salt. 330 calories, 6.7g fat, 2.9g saturates, 6.7g sugar, 1.3g salt. 299 calories, 4.5g fat, 1.6g saturates, 44.2g carbs, 7.7g sugars, 6.4g fibre, 17.3g protein, 1.9g salt. 333 calories, 3.8g fat, 1.3g saturates, 54.7g carbs, 9.3g sugars, 3.8g fibre, 17.9g protein, 1.6g salt. So far, I've cooked the Low Low Tomato and Basil Pasta for my youngest who is a pasta fiend. She’d eat pasta for every meal if I let her. Although she can be a bit fussy about the sauce, she loved this version. 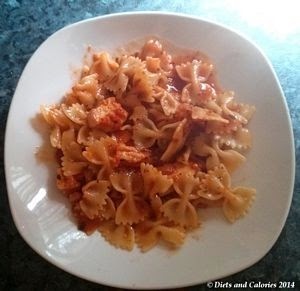 It's described as 'Chicken breast pieces in a sweet tomato basil sauce with pasta'. I also had a taste and found the sauce to be deliciously light with a good tomato flavour and not too heavy on the basil. This is a decent sized portion for one person but I added some broccoli and green beans for extra fibre and nutrients. I've also tried the steamed Chicken & Chorizo Paella. It’s described as ‘Arborio rice with chicken breast pieces and chorizo, red peppers & peas in a smoky tomato sauce’. This one is cooked in the microwave the same way as the regular ready meals. The difference with the steamer packs is they come pre-holed! Rather than piercing the holes yourself, the steamer lids have lots of teeny holes, so all you do is put it straight in the microwave. After 7 minutes it’s ready. This meal looks very fresh and healthy with its vibrantly coloured red pepper and peas. Just give it a gentle stir and it’s ready to eat. My hubby had this one for dinner one night but I insisted on tasting – for review purposes of course. There is a good distribution of chicken amongst the rice with lots of veg. From the bit I tasted, the chicken was nice and moist, rice well cooked and veg properly cooked. However, I found it quite spicy, as in chilli spicy rather than paprika or smoky. It was a bit hot for me, but hubby loved it. Well, I still have another six meals in my freezer waiting to try out. If the two we've had are anything to go by, I’m sure we won’t be disappointed. They're also getting extremely good reviews from others who have tried them. 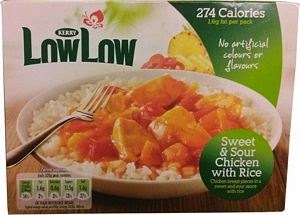 At the time of writing, Kerry Low Low frozen ready meals are available in Morrisons and ASDA. They’re also on special offer at £1.00 each, down from £1.50. According to the Grocer magazine, Weight Watches is the market leader in the healthier frozen ready meals market. (See article). I tried the chicken tikka masala today and it was delicious also. I cant wait to try the rest of the range.